It’s City Of God with videogames in it, it is. I was in Vigario Geral, last month. 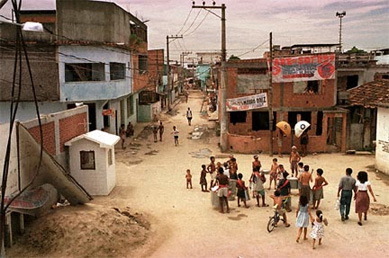 It’s a favela – or shanty-town – in Rio de Janeiro, near to the International Airport. In August 1993, 21 civilians were killed there, when a group of hooded, heavily armed men fired indiscriminately at residents for a couple of hours. The attack was carried out by military police officers in revenge for the killing of four policemen at the hands of Vigario Geral-based drug-runners. At one point, they gunned down a family of seven in their own home. Not Notting Hill. Not yesterday. When I was there, the sun was shining, people were smiling. I enjoyed a lovely plate of feijoada, Brazil’s national dish, and drunk some Brazilian beer. On every strategic corner there were people with walkie talkies and a few with AK-47s. Still, there was a new hope. The spirit was good. I was in Brazil on a mission for the Dutch Ministry of Economic Affairs. Most of the time I visited high-profile companies, who told us that Brazil was no longer a third world country and demonstrated what had been achieved in the last few years. To get a more balanced view, we were also invited by IBISS, a Dutch-Brazilian organisation supporting the development of 52 of Rio’s 648 (!) favelas. Each of those favelas houses around 5000 people. Dida vowed to definitely study harder this year. He was now 48. Nanko van Buuren, the director of IBISS, showed us what had been done. More and more people were bothering to go to school.There was a medical post.People were once again proud of their neighbourhood. Nanko could walk around like a godfather in Vigario. He knew everybody. Even people with Uzis hugged him. 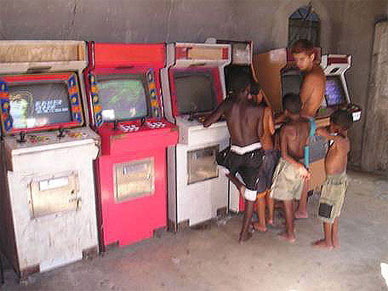 Arcades aren’t unusual in Brazil. In the upmarket city of Petropolis, I found five in one shopping centre, each with around five to ten machines. Most of these arcades are pretty slick, with a row of PSXs built into wooden cabinets, where you can play Pro Evolution Soccer, and pay for the time you use it. There are always crowds of young guys around the machines, and they mostly play using Spanish or English clubs. Although I didn’t play against them, they seemed to be at a pretty high level. Would the natural football talent of Brazilians reflect on their PES skills? It certainly seemed like it. One of the main enemies in a shanty-town is boredom. It’s incredibly hard for people to find a job outside the favela. They don’t have any education and aren’t used to the rhythm of getting up to work. So they remain unemployed and bored. Children are easy prey for the drug trade. Fed up and directionless, the drug dealers give them attention and the money gives them status. They can’t just play outside in a normal way, because of the casual gun culture. Nothing therefore made me happier than seeing small children safe and playing in little videogame arcades. Each place usually had about five or six machines.Many of them were Neo Geo AES systems. I don’ know if they were legal machines, or illegal copies, but for 1 Brazilian dollar, I could get five coins to play. Only 3.21907p a game. Them were the days. And play we did. Although I couldn’t enjoy it for long, as it wasn’t safe to stay by myself in the favela, I did manage a few games of Bomberman. They were good. They were swarming around me and I could only narrowly avoid their bombs. But they didn’t know I had already played Bomberman back way before they were born. In 1991, I even got out my old soldering iron and created an adapter to play a four-player game of Dynablaster, the Amiga version. It was my first hardware project, and the reward was being able to blow up both my brothers and a friend at the same time. At first, the little guys hammered me. But in the second round, I did much better and achieved some hard-won street crediblility in the favela. Other games I saw in the Vigario arcades were King of Fighters 2001 and Tekken. The aggressive fighting games always got the most attention, but the atmosphere was always relaxed and happy. 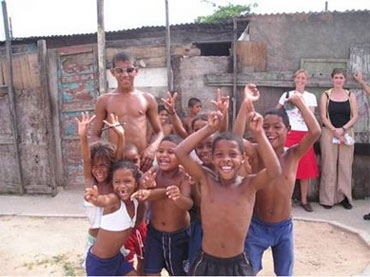 For a few moments the kids were not Leonardinho or Roberto from the favela. They were heroes who conquered worlds or commanded spaceships. Although videogames might only play a small part in redeveloping these quarters, they allow people to hope and dream and escape from their miserable situation for a few moments.